5 Do You Need to Refill Oil-Filled Electric Heaters? 7 How Oil Filled Heaters Work? Oil filled heaters are an energy-efficient way of keeping your home warm in the colder winter months. Whether you want to add some additional heating to a room, implement zoned heating to save money or replace all your existing heaters with oil filled ones, there are plenty of different models that you will be able to choose from. 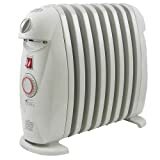 Oil filled heater reviews will give you some examples of some great portable and fixed heaters that you can buy today. 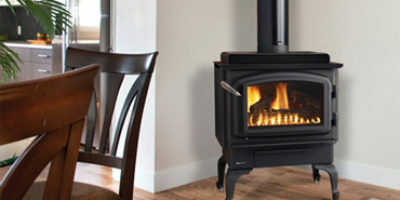 Before you make your purchase, you should make sure that you know what kind of heater will suit you best, which is why we have included more information in this buying guide. You’ll find out what to look for as well as some details about how an oil filled heater works. We hope that this guide will help you to find the best oil filled heater for your needs. It is winter again, you are freezing and you just want to heat your home quickly and save some money. This oil-filled radiator will with no doubt help you do that. It can heat areas up to 144 sq. ft. It is super easy to use and when it is working you pretty much can’t hear it. The tip-over switch helps ensure safe operation. This radiator works just as good as the more expensive heaters and is definitely a lot cheaper than a coil heater. You should be careful though, if you have kids around, watch them because the heater could get very hot to touch (but at the end of the day that is actually what we want). Another advantage is that the wheels are on metal brackets with metal screws and they will be hard to break compared to the plastic ones. The remote control and the digital thermostat that this unit offers contribute even more to your comfort. Can’t cover rooms larger than 150 sq feet. 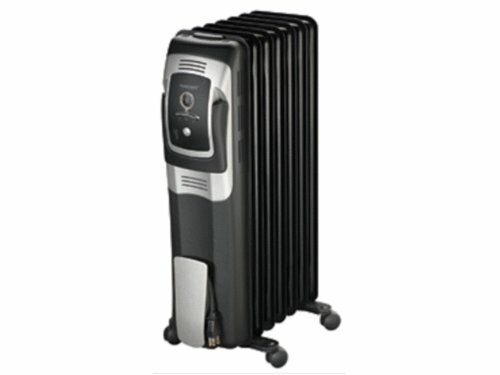 The DeLonghi EW7707CM is a great heater for medium or larger rooms. It is capable of providing constant heat for your room thanks to the 1500-watt heat output. It is also silent in its operation so that you can enjoy your activities without being disturbed by the noise of the heater. The patented assembly of this heater features steel construction, providing durability and high quality. The oil reservoir is also permanently sealed to prevent leaks and the need to refill the heater. When you want to reduce your energy bills, simply press the ComforTemp button, this will automatically maintain the temperature of the room at a comfortable level. The thermostat that comes with this heater is adjustable so that you can choose from 3 heat settings according to the level of warmth that you’d prefer. SmartSnap wheels are included with this unit. They will help you to move the heater around more easily and the great thing is that you don’t even need any tools to add them. They simply snap into place so that you can start wheeling the unit around straight away. The heater itself has longer radiator tubes than most on the market so that you can benefit from the same amount of heat in your room but a safer surface temperature of the heater itself. This Delonghi oil filled heater is sealed with pure diathermic oil so that it creates a permanent seal. This will ensure that you will never need to refill this heater during the time that you own it. A 24-hour timer that has 96 settings is included. This means that you can have complete control over the heater to save energy when you are not using it and to ensure that the heater will have time to heat up so that the room is warm for when you get home for example. The heater has been designed with vertical thermal tunnels. This spreads the heat out over a wider surface area so that the most heat can be outputted into the room whilst keeping the heater as cool to the touch as possible. This ensures safety whilst it is being used in your home. An antifreeze setting allows the heater to run at the lowest possible temperature at all times. When you want to save energy but ensure that your home does not become wintery cold, you will be able to use this setting, which turns the heater on for a little while to keep the temperature above freezing. Overheat protection is also included and this will protect the heater and prolong its life. 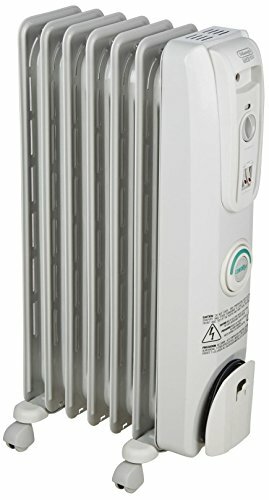 With 1500 watts of heat output, you can be sure that the DeLonghi EW7507EB oil filled radiator heater will be more than sufficient to keep a small to medium sized room warm. With silent operation and no annoying lights, you could even have it in your bedroom whilst you are sleeping. Steel construction means that this heater will be strong and durable and it will not rust. In addition, this heater will never leak due to the permanently sealed oil reservoir. The heater will never lose oil and will never leak. A 24-hour timer allows you to make great energy savings as you can choose the length of time you want the heater to be in operation for. Up to two-time settings can be chosen in a 24-hour period and you can choose blocks of time up to 8 hours for each. This allows convenient control of the heater at morning and night times for example. For your safety, this heater comes with a thermal cut off switch and the design has rounded corners. The thermal cut-off will turn off the heater if it begins to get too warm and this will protect your home from the risk of fire as well as protect the parts in the heater. 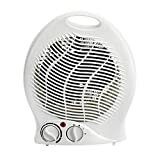 The DeLonghi TRN0812T portable oil filled heater offers 1200 watts of power to ensure that smaller rooms in your home can benefit from supplemental heat in the colder months. This heater has been designed to offer convenient use as well as being silent in its operation. 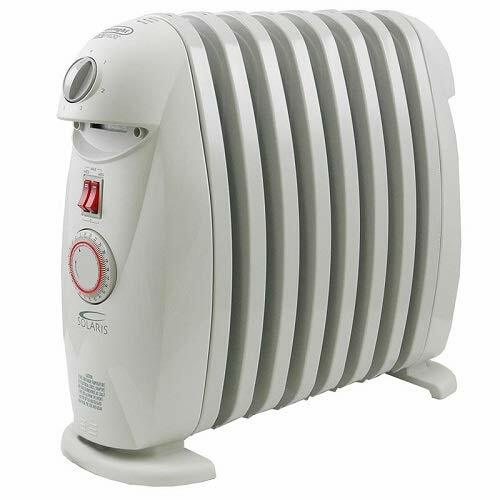 As this is a compact sized heater, you will be able to use it even in the most cramped of rooms. You will also be able to store it away when it is not in use, which is really useful when you are limited on space. During the summer months where the heater is not needed, you won’t need to leave it out in walkways where it is likely to be in the way. The timer has 96 programmable settings so that you can have maximum control of your heating. Whether you want to change the heat levels or have the heater turn on and off at certain times of the day, you’ll be able to enjoy the warmth of this heater when you need it. Heating safety functions are also included. To prevent the heater from becoming too hot, overheat protection is included. It also has an anti-freeze setting to make the heater switch on when the temperature of the heater drops too low. Both of these features protect your heater from damage. 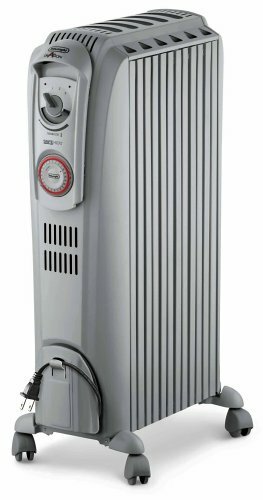 The DeLonghi MG7307CM heater features a great design and will produce plenty of heat in your home. 7 fins are welded together and are sealed to prevent leakage. You will never need to refill the oil in this heater as a result of this. To be able to fully enjoy this heater, you can use the ComforTemp function to maintain a comfortable temperature between 68 and 70 degrees Fahrenheit in your room. This heater will automatically turn on when the temperature drops too low so that it is well protected against freezing temperatures. This is the anti-freeze function and it can be turned on or off as needed. If you like your appliances to be as easy to use as possible, you will like this heater. At just the press of a button, you will be able to set up this heater as you need to. 1500 watts ensures that enough heat is produced by this heater to warm up a small to medium sized room effectively. It produces comfortable heat and will keep you warm in the winter months without needing to turn on your entire heating system. This will help you to save money on your energy bills as you won’t need to warm up your entire home. 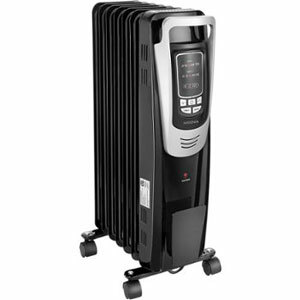 This Honeywell 7 Fin oil filled radiator heater is a great choice when you need a temporary heating solution. The thermostat feature allows you to easily set the temperature that you would like the heater to maintain so that you can have comfortable heat at all times. You can also use the timer that allows you to save energy and money on your heating bills. 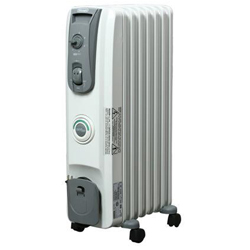 This oil filled heater is completely safe to use as it is made of high-grade solid steel. It is also finished with enamel to give the strongest possible finish and greatest protection against rust. You can also be sure that it will never leak due to the strong machine welded construction. A standard HPN style 3 pin plug is connected to the power cord of this heater so that you can plug it directly into a socket for power. Finally, it features a power indicator light so that you can see at a glance if it is on or not. There are 3 different heat levels for you to choose from when you use this heater, the lowest setting allows you to save energy and keep your room just warm enough whilst the higher two settings allow you to enjoy a more powerful heat. When you are looking for an oil filled heater for your home or workplace, it is important to know what to look out for so that you can be sure that you’re choosing the best model for your needs. Is An Oil Filled Heater Right For You? Before you even begin looking for the right oil filled heater for your needs, you should make sure that this will indeed be the right type of heater for you. 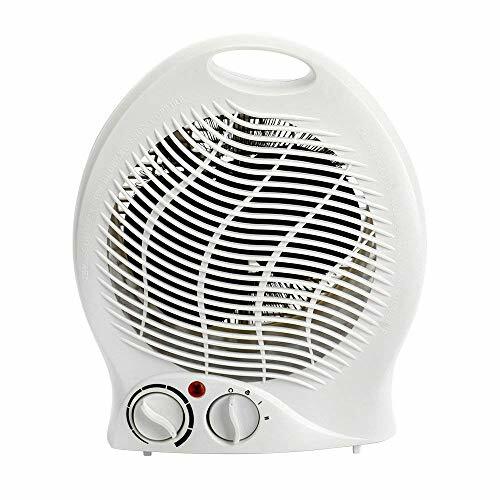 There are sometimes when these heaters are not suitable and in these cases, you should look into the possibility of choosing a different kind of heater. If you have a smaller room with no draughts, then an oil filled heater will be perfect, but if you have more space to heat such as a garage, you should certainly think about an alternative option. Oil filled heaters rely on convection currents to heat an area so if there is too much air to warm up, you are unlikely to feel the benefits if you have a room that is too large. In addition, garages aren’t usually well insulated and as a result, these are probably not the best environments in which to use an oil filled heater. Heat will most certainly escape into the areas of your garage when there is a draught. You should also be wary of choosing an oil filled heater if you are concerned about heaters that become hot to the touch. Oil filled heaters do become very hot when they are in use. Buying an oil filled heater should involve making sure that the model that you choose will be sufficient for heating your room. You should ensure that you take correct measurements of each room that you will be using it so that you can calculate how much heat output the heater will need to produce. Measure the length and width of your room in feet and multiply these values together. This will ensure that you know how many square feet your room is. Most of the oil filled heater product descriptions that you’ll find online will give an indication as to the size of the room that the heater will be able to warm up. You should remember however that this value will be under the best possible conditions and won’t allow for draughts and poor insulation, so you should try to choose a heater that can warm up a slightly larger area than you need. You should also ensure that the heater will be the best size for your room. If you don’t have much space to stand a heater, you should choose a more compact size. Remember that the smaller the heater, the hotter the surface temperature of the heater is likely to be as the heat can’t be dispersed over as large a surface area. When you buy an oil filled heater, you should ensure that there are enough safety features to make it as safe as possible whilst you are using it. The design of the heater is important because this will ensure that the heater does not become too hot whilst it is in use. Heaters that are designed with longer heating tubes and wider fins ensure that the heat is spread out over a larger surface area. You should always look for the heaters that have taller fins as these will be cooler to the touch than their smaller counterparts whilst still producing the same amount of heat for your room. If you want to move the heater from room to room with ease, you will need to ensure that you’ll be able to do so. Some oil filled heaters come with wheels so that you can conveniently wheel them around. You should also look out for heaters that have plastic handles at each end as they will be safer to move if you need to. You should try to avoid moving oil filled heaters if they are still hot to the touch. More fins mean more surface area, so you should try to find heaters that are made with more fins if possible. This will again ensure that the surface temperature can stay low and it may even make the heater more powerful than an alternative model. If you want a really stylish oil filled heater for your home, you should be able to find plenty of designer oil filled heaters. You can even find heaters that can be mounted on the wall. If you are trying to concentrate on the look of the heater, however, you should try not to get distracted with focusing too much on design. Remember that there are other more important factors that you should be looking out for. When you choose an oil filled heater, you should ensure that it will be as durable as possible. You will be able to find heaters that have been made with different types of materials and that have been made in a different way to the next heater. If you can identify the best quality method of creating a safe heater, you’ll have more chance of choosing the best one for your needs. You should look out for a heater that is made of steel. Steel is strong and durable whilst also being easy to maintain and keep clean. It will also not rust. To further protect against rust, many of the better heaters have an enamel coating. Enamel is strong and will not flake easily. Again, it is easier to clean. The more fins that there are on the heater, the more chances that there are for something to go wrong. You should look out for heaters that have been machines welded for strength and prevent leaks. Oil filled heaters should never leak and they can be dangerous if they start to leak out oil. Whilst a warranty may not be a deciding factor when you are looking for a great oil filled heater, it should still be important to you. This will ensure that you will be able to have some protection against your purchase for a certain amount of time. Whilst oil-filled heaters can be relatively inexpensive if they fail within their first year or two and you have no warranty, then it could be unnecessarily costly to need to replace the heater. Some companies offer a standard 1-year warranty. This will mean that the manufacturer will repair or replace the heater if it develops any problems in the first year. If you use the heater often enough, you will find that any faults that may develop after purchase will usually occur in the first year after purchase. Often, a 1-year warranty will be all that you’ll need. For a little more peace of mind and a way of guaranteeing that you will have a working heater for a few years, you could choose a model that offers two or three years of warranty. Obviously, the longer the warranty, the better. You should also be aware that the kind of warranty that is offered will differ from manufacturer to manufacturer. A limited warranty will usually only cover certain aspects of the heater. You should read the small print that comes with the product to find out what level of warranty you’re being offered. There are plenty of great advantages to using oil filled heaters in your home. You can save money on your heating bills as you only need to use one heater at a time. Instead of having an entire central heating system in use in your home, you can use an oil filled heater in the room that you are in. Oil filled heaters take a while to heat up, but they also use electricity effectively. This ensures that these kinds of heaters are as economical as possible so that you can keep your energy bills low. With safety features built in such as overheat protection and thermostatic controls, you will be able to have complete peace of mind when you are using your oil filled heater. Most oil filled heaters can be moved from one room to another. 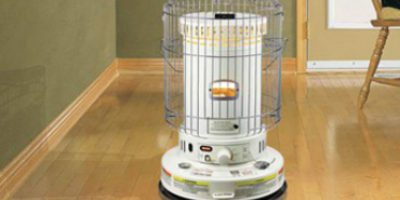 This can be a convenient way of saving money as you can simply take the heater with you to use in another room. This means that you’ll only need to buy one heater. Programmable timers allow you to have the freedom to set the heater to turn on at certain times in the day. This will save you money whilst ensure that the heater has had enough time to warm up before you need to start using it. Use the timer to make the heater turn on before you arrive home from work, for example, to ensure that you come home to a comfortable heat. These heaters often come with a warranty so that you can rest assured that your heater will last you for many years. When you buy an oil filled heater, you will be able to enjoy many great benefits such as longer lasting heat and a comfortable temperature in your room, but how do they compare to ceramic heaters? Ceramic heaters are usually lighter in weight than oil filled heaters. This is because these heaters do not have any liquid weighing them down. Oil filled heaters, on the other hand, are far heavier as they are filled with oil and feature fins which spread the heat across the area of the heater. When you turn on a ceramic heater, it can warm up quickly. If you want instant heat in your room, then these kinds of heaters are a perfect choice. On the other hand, once the ceramic heater has been turned off, it will be cold instantly, which isn’t the best use of energy. Oil filled heaters have to warm up before you can benefit from their heat, but once they have successfully heated up, you will be able to enjoy warm air for longer. This is because the oil retains heat better than ceramic heaters. You will need to take extra care around oil filled heaters as they become very hot to the touch. Do You Need to Refill Oil-Filled Electric Heaters? Although it is true that oil filled heaters are indeed filled with oil, you do not need to worry about them needing to be refilled. When you use the oil-filled electric heater, electric heats up an element and then the oil is heated by the element. The oil then circulates around the fins of the heater. Because there is no combustion reaction, no oil is burned when these heaters are turned on. This means that the level of oil will never drop. You will never need to refill the oil as a result. Oil filled heaters are made to be tough and durable and they are also designed so that the temperature of the oil can’t be high enough to cause the heater to burst. Your oil filled heater should never start to leak as a result of this. If you notice anything different about your oil filled heater, such as a strange noise like there is a lot of air in the heater or if you notice that the heater is leaking out any fluid, you should turn it off immediately. Unplug the heater and ensure that you either throw the heater away and buy a new one or call a professional who will tell you if it is possible to fix the heater. As with any electrical heating appliance, it is important that you take care when you are using oil filled heaters in your home. Although they are designed to be as safe as possible, you should bear in mind these safety tips when your heater is on. It can be very dangerous to use any heater with an extension lead. You should always try to plug your oil filled heater into a plug socket. If this isn’t an option, you should ensure that you purchase a high-quality extension lead that can handle the load on your heater. Heating up oil makes these heaters potentially hazardous if they are not wired up correctly. If you are buying a new oil filled heater, you should ensure that it has safety certification and you should always purchase from a reputable source. In addition, it is important that you buy a new heater as there is no way of knowing how safe a used heater will be. You should never try to repair or open up an oil filled heater. If your heater is expensive, you could contact a professional who may be able to repair and service your heater, but most oil filled heaters are very cheap these days and it is usually safer to replace them. Remember that the heater will certainly get hot when you are using it in your home so you must keep it free from any obstructions. Do not use the heater to hang laundry on to dry and do not let children or pets near the heater to avoid injury. When you are not using the heater, you should ensure that you switch it off and unplug it. Ensure that you do not alter the thermostat with any tools as doing so could lead to the unit overheating. How Oil Filled Heaters Work? 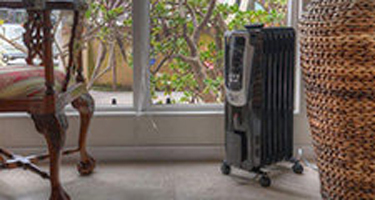 An oil filled heater looks like a standard radiator that you may expect to see in older buildings, but these kinds of heaters are far smaller. The heater is made up of fins that are joined to one another and they often have an open space in between each of the fins. A control panel at the front of the heater allows you to control it. In addition to the fin style models, you can also find these kinds of heaters that are made up of a single panel. Oil filled heaters are usually made to be portable and they plug into your home’s electric supply using a standard plug. Electricity enters a resistor within the heater and is converted into heat. This warms up the oil in the heater. As the oil begins to warm up, it circulates around the design of the heater. The moving heat is transferred and spread over the fins, giving the heat a larger surface area to escape from and this heat begins to radiate out into the room using convection currents. As there are no fans, this kind of heater is particularly quiet and they require very little maintenance. All you’ll need to do is clean off any dust each week so that dust doesn’t accumulate in the fins of the heater. Although oil filled heaters are great to use as supplemental heating in your home, there are some environments where these heaters are more suitable than others. If you have a smaller room to heat up, then this kind of heater will be ideal. You will be able to enjoy soothing and even heat that is distributed throughout your room to provide comfort when you need it. You should avoid using these heaters in less suitable spaces such as garages however as they will simply be a waste of energy. 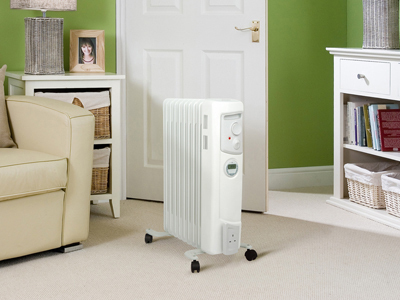 Oil filled heaters are more suitable for use in homes that don’t have small children or dogs. These heaters become incredibly hot to the touch, and even the ones that take measures to be as cool as possible when they are in use can still have the potential to cause burns. If you have small children or pets at home, you should consider choosing a different heater. If you want a portable heating solution that allows you to move your heater from one room to another, then an oil filled heater is probably for you. You will have to wait for your heater to cool down before you move it however as the heater will be hot to the touch and will be dangerous to move when still warm. As you can see from this useful buying guide, there are all kinds of great oil filled heaters out there for you to choose from, with plenty of advantages to enjoy when you do use them. They are a convenient and portable solution when you want heat in the winter months and they will mean that you won’t need to turn on your entire heating system in order for the room to be comfortably warm. You will also be able to buy an oil filled heater and use it immediately as they don’t require any assembly or installation. Simply plug the heater directly into a plug socket and it will be ready for use. These useful oil filled heater reviews are a great way to find out about some of the models that are out there. We hope that you’ve also found this buying guide helpful in choosing the best oil filled heater for your home. What is importance of No. of fins (9 fins, 11fins) and Fan in OFR heaters? I am from india and in my city average temp. in winter is 10 degree celcius (50 degree Fahrenheits) and my room is 15×20=300 sq feets. I should go for 9fin OFR (https://www.snapdeal.com/product/orpat-80012002000-ooh9-oil-filled/634257744#bcrumbSearch:orpat%20ofr) without fan or 11fin OFR without fan (https://www.snapdeal.com/product/orpat-100015002500-ooh11-oil-filled/901711190#bcrumbSearch:orpat%20ofr) or 11fin OFR with fan (https://www.snapdeal.com/product/orpat-100015002500-00h11f-oil-filled/664014030#bcrumbSearch:orpat%20ofr). Hello I already have an Aiflow oil filled radiator and love it and want to buy another one. However the one I am considering is a PRO Elec (energy class A?) and this is not listed in your review ? Is this because it is not such a good make ?